But deep inside him, he dreamed big. That was when he embarked on a life-changing journey. And he didn’t look far. He found a job at a real estate and construction firm in Manila owned by his cousin Ricardo. Consunji worked there as an apprentice. As such, he didn’t get any pay for the first four months. That didn’t matter. After all, he wanted to learn the ropes of the trade. How to make an estimate, a summary of items of work for a project, preparations for a bid and managing construction projects were invaluable lessons he learned from his relative. Once while working as a cement mixer inspector of a project in Paco, Manila, in 1954, then 38-year-old Consunji asked himself: why not venture into construction? Initially, he bought a second-hand one-bagger concrete mixer for only P500, quite high at the time. When the equipment was repaired, a prominent builder wanted to buy it for P3,500, a whopping seven times Consunji’s purchase price. Though the offer price was tempting, he thumbed it down. His reason: he had long-term plans to play big in the construction business. And he could not take off without the mixer. To Consunji, that decision was a defining moment in his drive to become a key player in the construction industry. 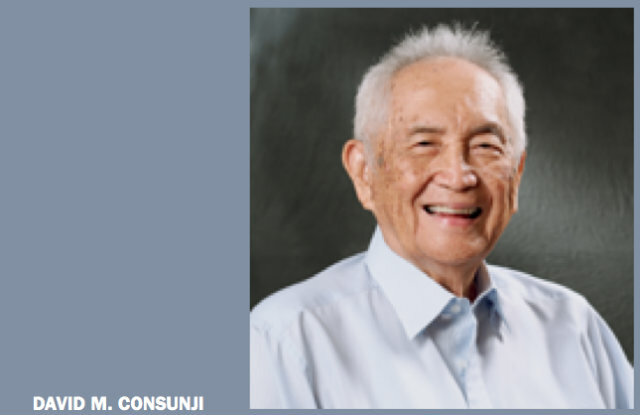 In the early ’50s, he formed his sole proprietorship company, the David M. Consunji Civil Engineer Contractor, now known as DM Consunji Inc. (DMCI, to bid for projects. His first contract – a time keeper’s booth of oil firm Stanvac (now known as ExxonMobil). 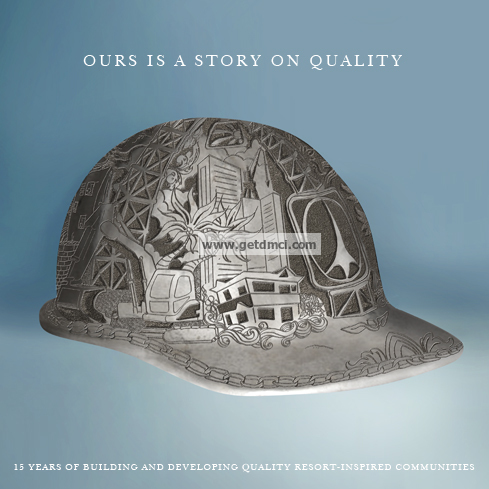 What followed was a long queue of projects that made DMCI the choice builder. It was at the forefront of shaping the Makati central business district since the ’60s, beginning with the old Monterey Apartments, Rizal Theater, Tower One and Exchange Plaza. After DMCI’s initial projects, the company soon caught the attention of major businesses wanting to put up corporate headquarters, landmark edifices, highways and bridges, commercial as well as industrial buildings all over the Philippines. The company also built the Shangri-La Hotels in Makati, Mactan and Boracay, Manila Hotel, The Westin Philippine Plaza, the Asian Hospital Medical Center, Cultural Center of the Philippines, among other distinct landmarks. With Consunji’s hands-on stewardship, DMCI further redefined the Makati city skyline and landscape. It constructed the Ortigas Center financial district, the South Metro Manila Skyway, LRT 1 North Extension, Tarlac-Pangasinan-La Union Toll Expressway. DMCI even had the privilege to flaunt its construction expertise abroad by building monumental projects like the Istana Urul Iman, the multi-billion dollar golden palace of Sultan Hassanal Bolkiah in Brunei Darussalam. The enterprising visionary in Consunji led to successful joint ventures and forays in other sectors, including water distribution, mining, power and housing. 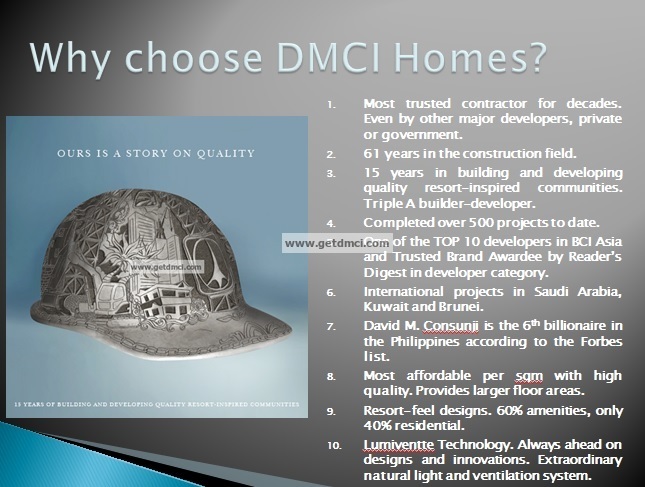 Guided by his forward-looking vision, DMCI is a listed holding company comprising major operating subsidiaries—D.M. Consunji, Inc. (DMCI), DMCI Project Developers, Inc. (PDI), Semirara Mining Corp., DMCI Power Corp., (DPC), DMCI Mining Corporation (DMC), DMCI-MPIC Water Company, Inc. (DMWCI), and the Sem-Calaca Power Corporation (Sem-Calaca). DMCI is engaged in general construction services, including production and trading of concrete products, and electrical and foundation works. It is noted for projects delivered on time and its pioneering application of advanced engineering methodology. PDI is into generating new projects and investments, while Semirara handles the exploration, mining and development of coal resources in Semirara Island in Caluya, Antique. It is currently the Philippines’ largest coal-producing company with a guaranteed long-term market contract with the state-run National Power Corp.
DMC is an ore and mineral mining and exploration firm which has entered into joint venture with Rusina Mining Ltd., a listed company in Australia. DPC is a business generation company which designs, constructs, invest in, and operate power plants. On the other hand, the DMCI-MPIC is a 45-55 consortium with Metro Pacific Investments Corp., which operates Metro Manila’s west zone water concession. Consunji’s corporate feats did not go unnoticed. “The Outstanding Filipino Awardee” (Tofil) from the Philippine Jaycee Senate and The Insular Life Assurance Co. Despite the plaudits, humility remains etched in Consunji’s personality. “First and foremost, I am a civil engineer and I love to build. I may demand perfection but I also value speed and technical knowhow as on-time delivery and quality workmanship are valuable in my profession,” he says. What distinguishes Consunji from his peers is his relentless search for perfection and new ideas. Not content with the quality of existing building materials, he pioneered the employment of precast, pre-stressed and high-strength ready mixed concrete. “I would like to feel that somehow, DMCI has been one of those who improved our standards of project completion through improved quality,” he says. At 90, Consunji feels fulfilled, leaving to his children a legacy, the endless task of sustaining the growth of the corporate empire he has founded, built and nurtured over the past decades. With multi-billion peso contracts piled up over the past decades, no wonder the construction tycoon has emerged as the country’s fifth richest person with an estimated net worth of US$2.7 billion as of last June.